Compared to the previous article (Tutorial: Catching Rogue Memory Accesses with Eclipse and GDB Watchpoints), I going beyond the normal watchpoint usage. 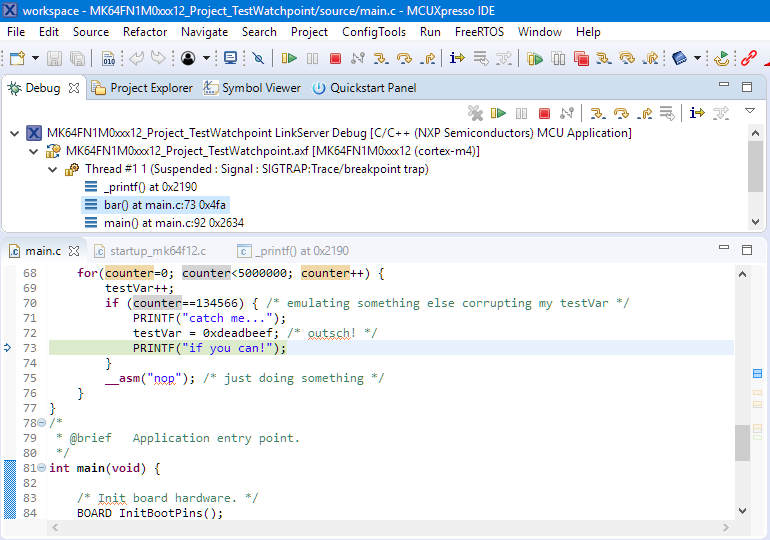 I’m going to use dedicated plugins and views in the free-of-charge Eclipse based NXP MCUXpresso IDE 10.2.1. 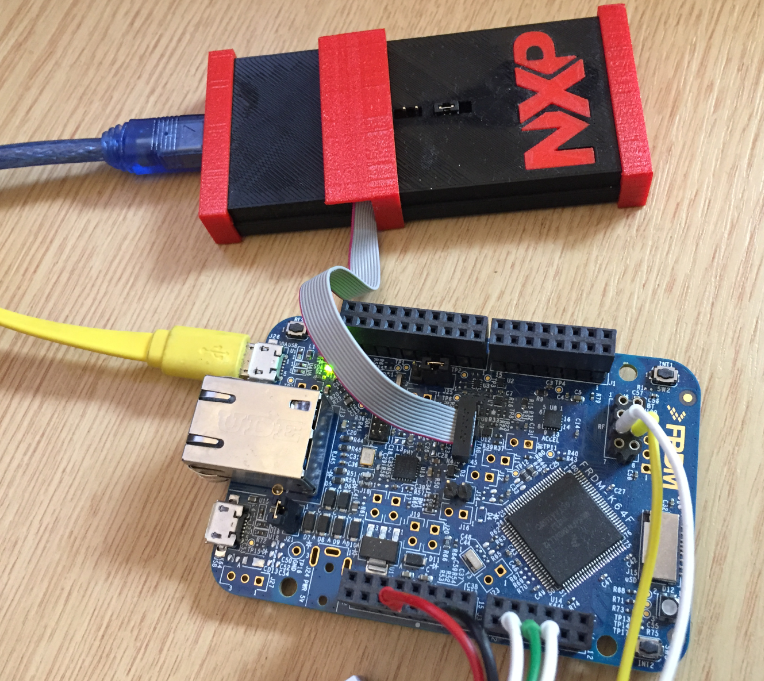 As board I’m using the NXP FRDM-K64F with an external NXP LPC-Link debug probe attached to it (see “Custom 3D Printed Enclosure for NXP LPC-Link2 Debug Probes“). Be aware that not every ARM Cortex-M device implements the capabilities used in this article. 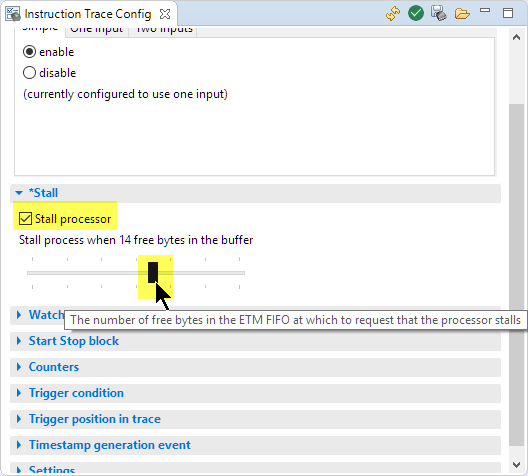 I’m using instruction trace with watchpoint triggers which do need the ARM MTB (Micro Trace Buffer) implemented, which can be augmented with the ARM ETM (Embedded Trace Macrocell). This uses a trace buffer in RAM which can be configured as ring buffer. On the plus side I don’t need any dedicated trace pins or expensive debug probes: I can use normal debug probes which are able to read/write the memory on the device. 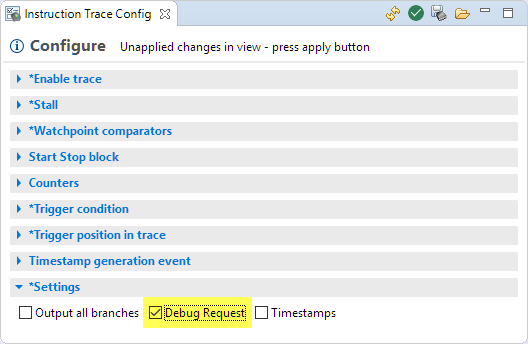 The needed trace configuration and knowledge is in the debugger and IDE. 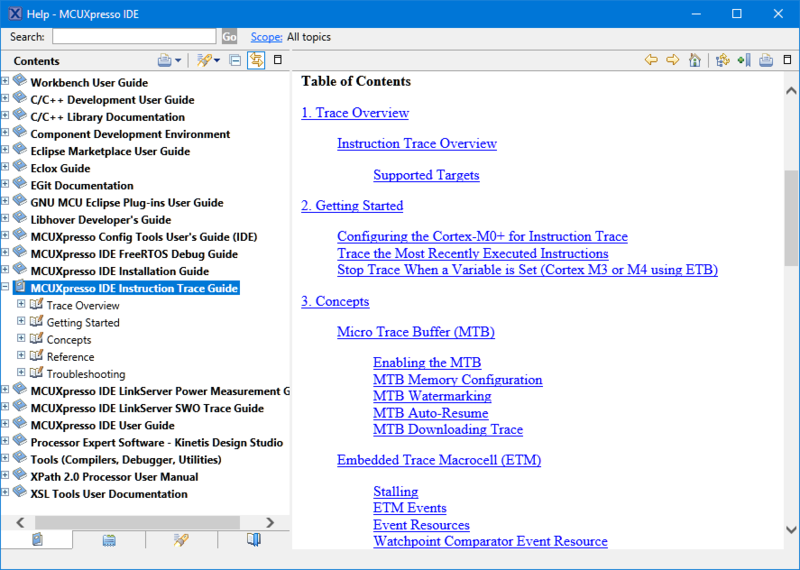 That way I have special views for configuration and trace viewing available in the NXP MCUXpresso IDE. 💡 It would be possible to configure the trace and watchpoint hardware with GDB commands/scripting or directly in the application, but this would be beyond this article. As in previous article, I’m going to use the following function as a test case emulating a rogue access to memory. 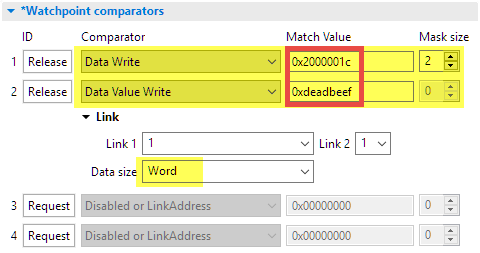 What I want to catch with the debugger is a write to ‘testVar’ with a value of ‘0xdeadbeef’. 💡 Note that the views used below are the ones from the NXP MCUXpresso IDE 10.2.1 and are not available in other Eclipse distributions. 💡 Keep that tab in the foreground/visible, as this defines the setting! I click on ‘Request’ button to get a comparator. I configure it for ‘Data Write’ at the address 0x2000001c. The mask is optional: with this I catch an address range. Additionally, that toolbar has save and restore buttons to save my precious configuration in a text/XML file (default is etmConfig.xml) on the disk. 💡 If the view does not show the loaded values (I had this in 10.2.1) after loading from the XML file: close the Instruction Trace Config view and re-open it again. Change a value (e.g. 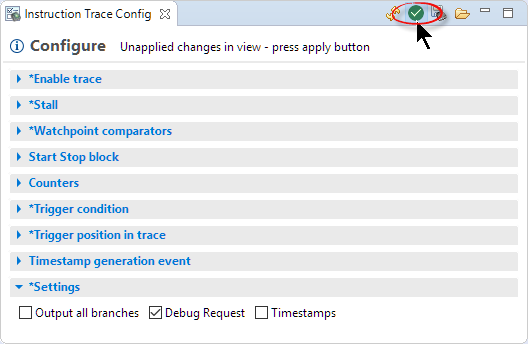 disable trace) and store it on the target, then enable trace again and store it again on the target with the green button. 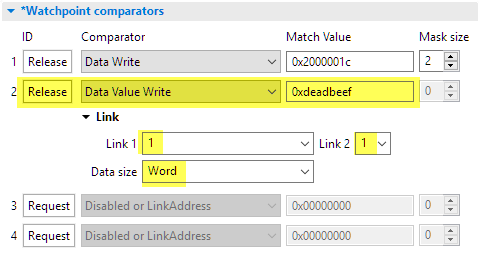 You still have to enable the comparators. Make sure you cross-check the values in the settings. 💡 As explained in “Tutorial: Catching Rogue Memory Accesses with Eclipse and GDB Watchpoints“, there will be some jitter and the target will stop a few instructions after the event, so you have to go back a few lines of code. In my application above the target finally came to a stop while executing instructions inside _printf(). Watchpoints with gdb are good, but hardware watchpoint triggers are better. But they are not easily accessible and might be complicated to setup. 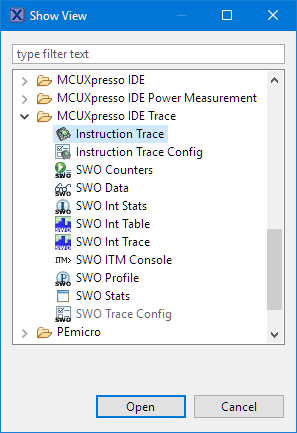 Using the MCUXpresso IDE helps, because it provides a convenient access to the ARM MTB/ITM hardware. 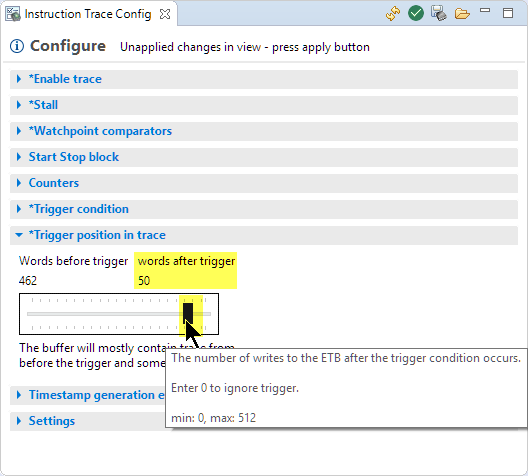 That way I can configure a watchstop trigger and as an extra benefit I get instruction trace :-). I hope you find this tutorial useful. 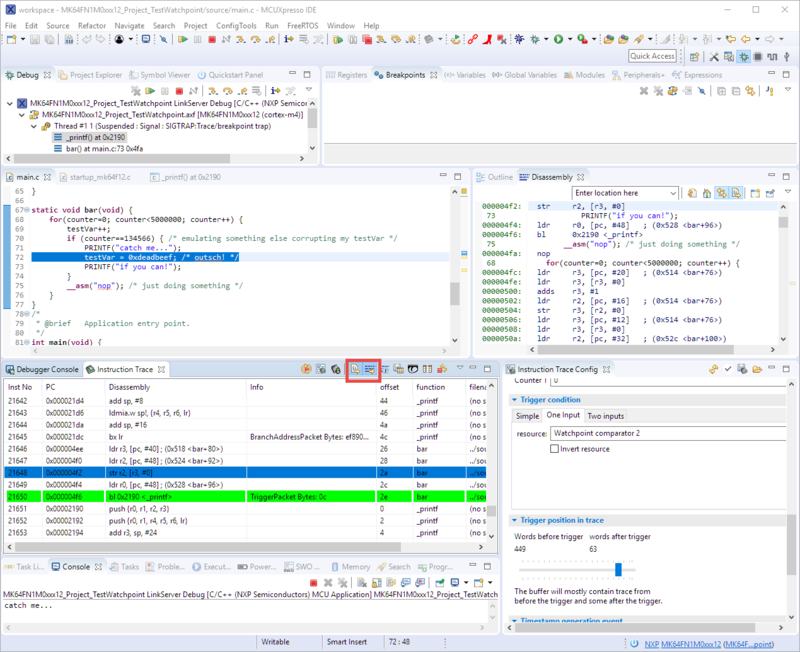 This entry was posted in ARM, Boards, CPU's, Debugging, Eclipse, Embedded, FRDM-K64F120M, Kinetis, LPC, MCUXpresso, MCUXpresso IDE, NXP, Tips & Tricks, Tutorial and tagged ARM, Cortex, Debugging, Eclipse, ETB, Instruction Trace, NXP, OpenSDA, P&E, Segger, technology, Tips&Tricks, Trace, Trigger, Watchpoint by Erich Styger. Bookmark the permalink. Thanks, Erich! I was able to replicate your test setup and caught a write of a test value to a specific variable. 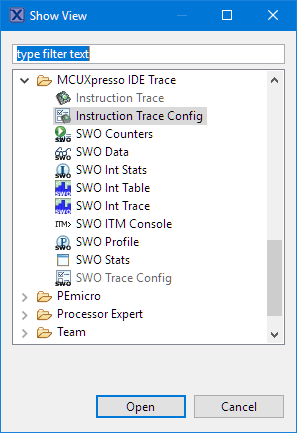 I tried using that on my ongoing FreeRTOS problem and it didn’t seem to catch a write of 0 to pxCurrentTCB, though it shows up as 0 in the memory view after the usage fault. I’m assuming the CPU can ‘skid’ past the comparator match by a few instructions? In any case I was able to get some trace information this last time I caught it, so I’ll be picking through that to see what I can find. yes, in my cases there was always some skid for the hardware to come to a full stop. I think if that access causes a usage fault, that probaly gets priority and fired before the trigger can act on it. Thanks for providing that link to this article: indeed, the application itself can use that hardware functionality. I wish to know if it is possible to catch the condition where a (global) variable is written with any value, but only when another (global) variable has a specific value (0). 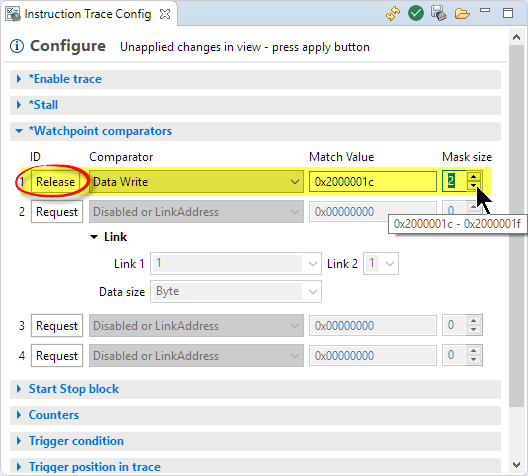 How must I configure the instruction trace to work such a way? I have not used it fro that particlular case, but with linking the trace triggers you should be able to do this. 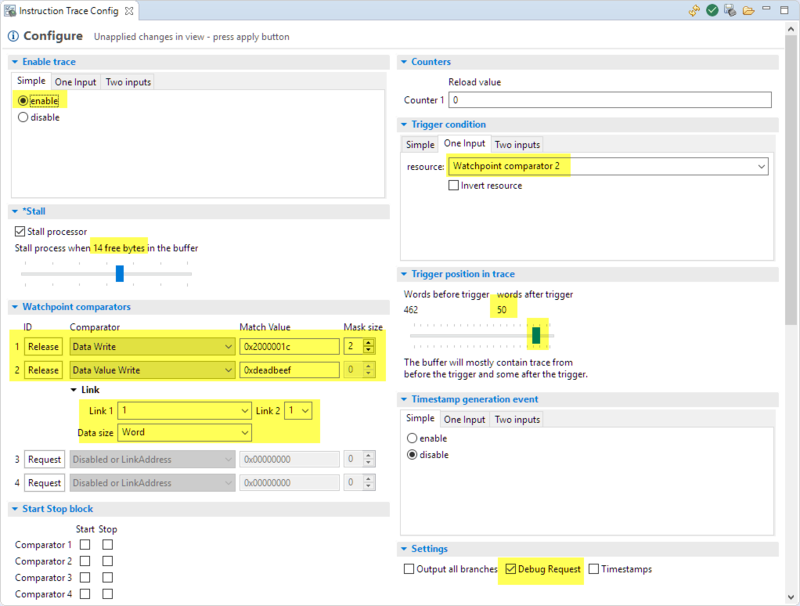 This configuration can’t be used because of the only 4 watchpoint comparators available are not enough. Is there any error? Why is the interrupt never executed? Is it possible to avoid stopping the execution during the debug session? Now it is correct. When I pasted the whole code a part was lost, maybe because of the post length.